Off the coast of Misrata—On the dark blue sea of the Mediterranean, Libyan rebels are planning their final offensive to bring down Muammar Qaddafi. 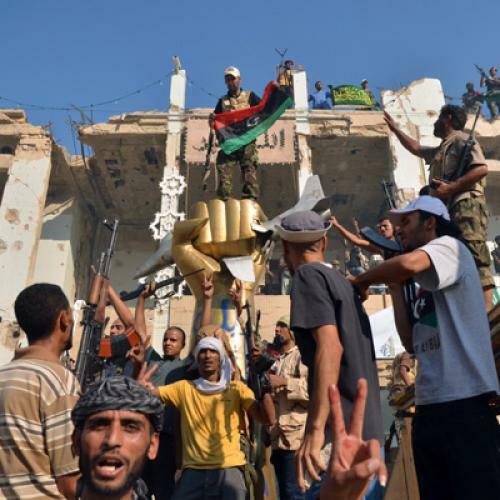 More than a hundred fighters set out from Benghazi Tuesday, transforming two tugboats into the official rebel fleet. The passengers are aware that Qaddafi’s military barracks have fallen to the opposition. The rebels, most of whom are observing the Ramadan fast, pass their time reading the Koran and quietly celebrating their victory. All are relieved that their campaign against Qaddafi is close to ending. The fighters—who range in age from 20 to 45—say they want to protect the capital and prevent chaos in the wake of the fall of the regime. “This is not Iraq,” says the group’s leader Anwar Al-Muqaryaf, referring to the anarchy that followed the collapse of Saddam Hussein’s regime. “We will secure Tripoli and make sure it is safe.” All the fighters on the boat profess sharing Al-Muqaryaf’s vision. The pictures from the last few days have filled these soldiers with a sense of fate. They now feel that it was their destiny to overthrow the regime that oppressed and baffled their nation, the millions of Libyans who only wanted to live normal lives. In their quest to do so, they prevailed against incalculable odds: Teachers had to become soldiers, and mechanical engineers were forced to learn weapons manufacturing. But these people, who have captured the world’s attention, desire above all to return to the ordinariness of their former lives once their next and final battle is over. They want to avoid turning into a praetorian guard, and above all, eschew a repeat of the type of dictatorship that governed them for the past 42 years.